Corporate Legal Times, LLC, which is based in Chicago, publishes the premier monthly business publication for general counsel and other in-house counsel. 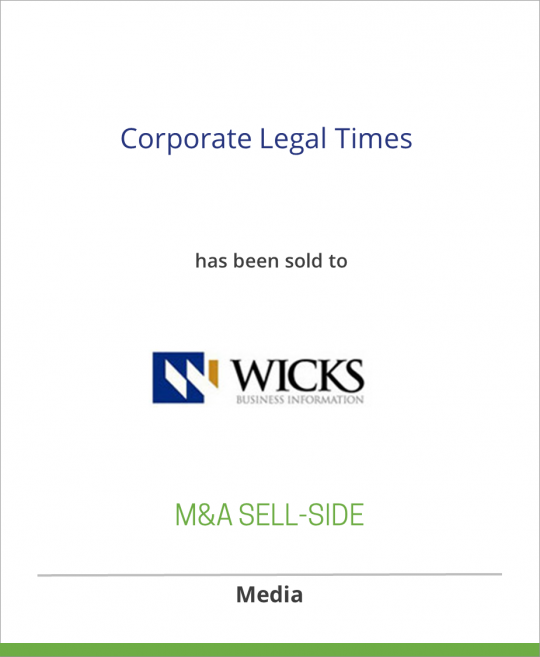 Launched in 1991, Corporate Legal Times is the oldest monthly magazine published specifically for in-house counsel. It has a monthly circulation of more than 40,000 U.S. in-house counsel, including more than 11,000 general counsel. In addition, through its partnership with the Canadian Corporate Counsel Association, Corporate Legal Times is also read each month by almost 2,000 Canadian Corporate Counsel. The company also produces an annual conference for in-house counsel, The SuperConference. Wicks Business Information, LLC (www.wbi.com) is a business-to-business information company based in Fairfield, Connecticut. WBI publishes Investment Advisor and Treasury & Risk Management. Its strategy is to acquire and build business-to-business information properties in the financial, general business and technology markets. WBI was formed in partnership with The Wicks Group of Companies (www.wicksgroup.com), a New York-based private equity investment firm focused on selected segments of the communications, information and media industries.